SOLD!! Symphony FCF is a modern filly with 3 expressive gaits and easy going personality. 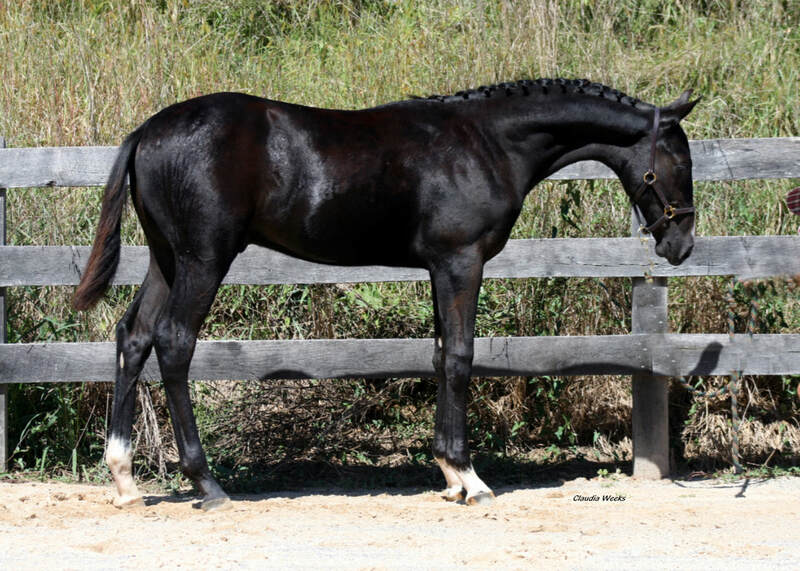 Tested WFFS N/N.Her trot has fabulous reach and she inherited Sternlicht’s strong topline. She is inquisitive and social with natural uphill balance as well as strong drive from behind. Her damn, Paget DB, has consistently produced tall, long legged offspring. Paget’s Sire Pointmaker is an Elite Hanoverian Stallion by Pik Bube, the most successful son of Pik Koenig. Pointmaker was Champion Stallion of the West Coast Classic two years in a row, where in addition to winning his in-hand stallion championship and under saddle class, he scored high enough in the dressage section to win the overall “Ultimate Sporthorse” award. Sternlicht’s foals consistently inherit his beautiful modern type and exceptional canter. His offspring are earning high-scores in-hand, including at large competitions such as Dressage at Devon. Sternlicht has an impressive show record including placing 3rd at the USEF FEI Six-Year Old Championships, winning the US Dressage Finals for both First & Third Levels, and having a median score over 70% in his first year at Prix St. Georges as a 7yr old. Judges at the August 2018 AHS Inspection at Hilltop called Symphony one of the best fillies of the day! They commented on her long lines, stating that she was elastic through the body with a good hind leg that carried through to the front leg. They commented on her excellent walk and stated that she was really loose through the back. This filly loves to MOVE! !